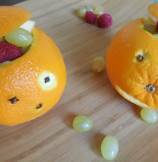 Jack-o-Lanterns Orange Fruit Cups are healthy and fun snack for kids during - all candy - Halloween days. Kids eat so much candy during Halloween, keeping some fun and weird looking fruit snacks in your mind will help you feed kids some healthy fruits. 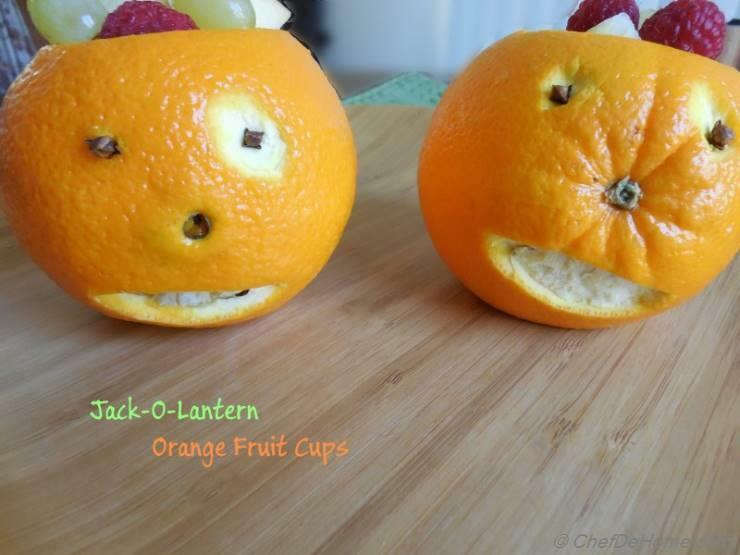 Kids will love these orange jack-o-lanterns and eat all fruit in no time. To keep it interesting, you can add some milk chocolate candies along with fruits or play with any fruits ideas. Anything or everything (bite size) which is good for kids can be filled into these orange cups. So, don't worry about your pumpkin carving skills, just carve some orange jack-o-lanterns for kids this Halloween. Its lot of fun, I am telling ya. 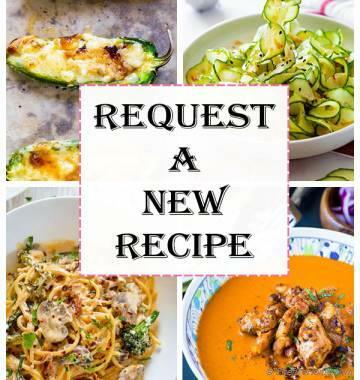 Looking for more Halloween recipes? 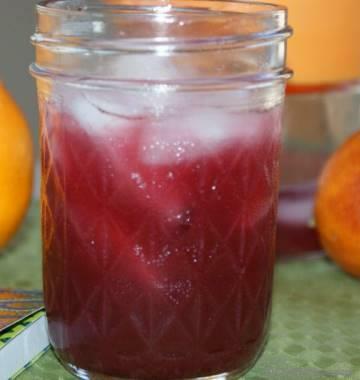 I have recently compiled, my top 15 favorite halloween recipe for you all! Check it out! Top 15 Halloween Recipes - Spooky, fun and Entertaining! 1. 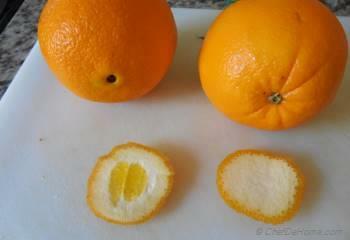 Cut a small piece from bottom of oranges to make'em easy to place on a tray or flat surface. 2. 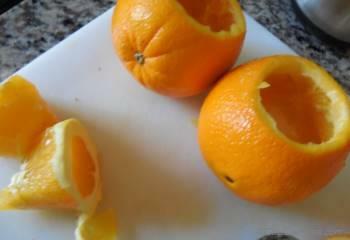 Use a small knife, cut the top small section to make surface flat. Keep the top pieces to use as caps later. Now, scoop out the flesh of oranges like we scoop out bread soup bowls. 3. Slice all fruits into bite size pieces including orange flesh and set aside. Use cloves to make eyes of jack-o-lanterns and carve small mouth. don't worry if its not neat, they look weird and creepy when not neat and that is what we are looking for. 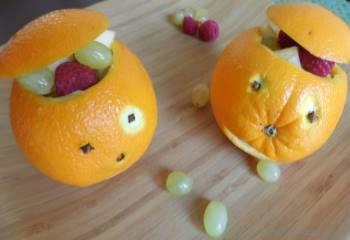 Fill oranges with fruit and serve with or without hats. Enjoy!! Don't throw away leftover orange cups. Simply, Sun or Oven Dry leftover Jack-o-lantern orange fruit cups and make homemade citrus candle holders for thanksgiving. 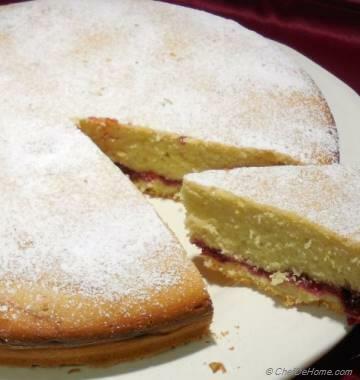 thanks for a Halloween recipe, I only see cakes and sweets everywhere, this one is little different. And I never thought to make holiday candle holders out of empty oranges. Awesome idea!! I made similar jack-o-lanterns last year with cored oranges and filled it with candies. I like your idea of filling with nuts and fruits. Brilliant!! 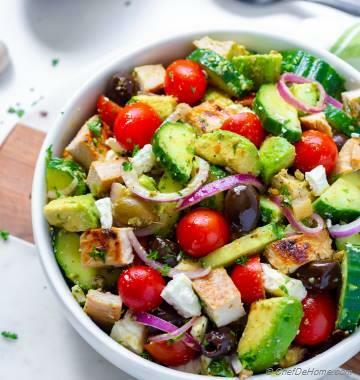 good idea, i really like the healthy part. 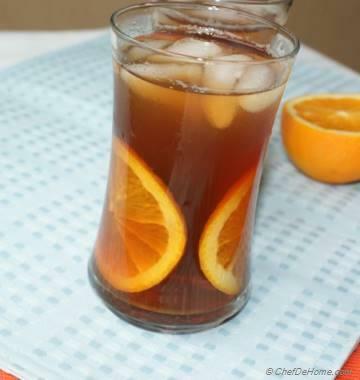 oranges look so good, you have good carving skills :) this recipe is a keeper.